Rechenzentrum, which means “data processing center” in German, is a Berlin-based duo who create live audio-visual performances by combining austere film visuals with their own brand of minimal techno, fusing elements of jazz, dub, and early industrial. Marc Wieser handles the music half while Lillevan navigates the visual landscape. Their 2003 DVD release Director’s Cut, originally out on Mille Plateaux, went on to win the Ars Electronica prize. 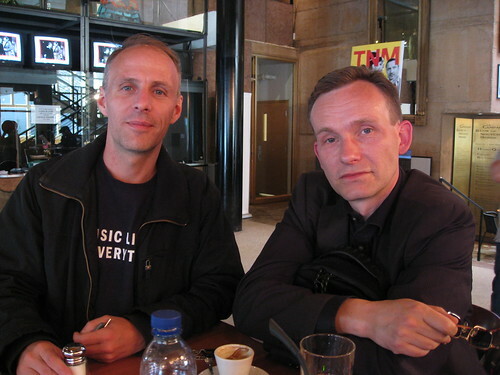 Marc and Lillevan sat down with us after their sound check for A/Visions 2 at Mutek 2008. Liz notes the spooky near-ubiquity of UC-33e controllers running Ableton Live at Movement. A collection of international curators and festival programmers discuss the balance of a festival’s guiding principles. Barem, aka Mauricio Barembuem took the stage at the slightly foggy, humid SAT in Montreal on Friday and laid down thick, groovy, harmonic minimal tracks to an appreciative audience. Since 2003 he’s been DJing and performing live both in his home country Argentina and abroad and in 2005 met Richie Hawtin who encouraged him to submit a demo to Minus and his career promptly took off.